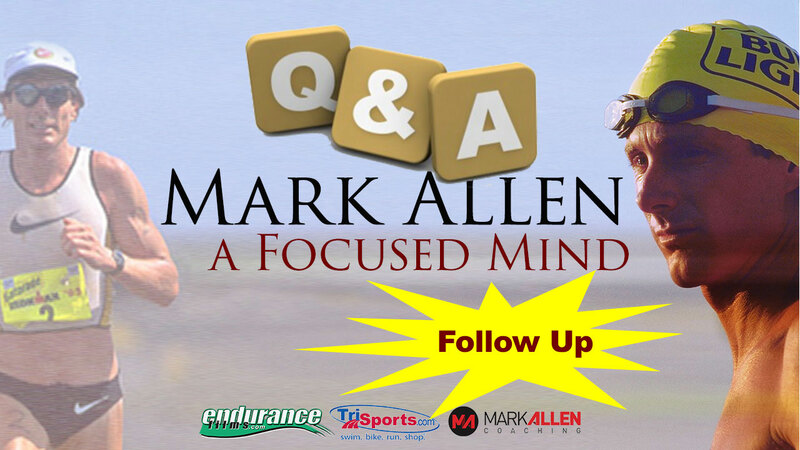 Last week the legendary Mark Allen joined us for a webcast called A Foucsed Mind. People had questions and we didn't have time to get to them all. Question: Thank you for sharing your insights. Big fan for many years. During your years as both an athlete and now as a coach what is the most significant shift you have made in your training/coaching for an event then years ago. Nutrition, Pacing, Training, Equipment...or a particular discipline focus? Probably the biggest change has been incorporating a bit more metrics into what I gather from athletes as they train to get a more clear picture of what is going on physiologically and mechanically in their bodies and movements. But the actual training methodology is very similar. Our genetics have not changed in thousands of years, and the basic energy systems that we need to compete are the same as always. Probably the biggest changes happened early in my career in how people trained. The main one was having a better understanding of how aerobic metabolism influences endurance performance and how to best optimize that during fitness development. If you want to know what I think could make a huge difference, it would definitely be having athletes actually train their mindset. This is something that people just do sort of by accident via each training session. But very few are really utilizing any kind of methodology to do that. Then the second issue that is still in flux in my opinion is dialing in how to eat during races. That has improved dramatically since I retired from racing, but it’s still not foolproof! Question: what is the best way to boost my run speed in the second half of the run in a 70.3. is it through brick training, strength training, over-distance similar to what you experienced to catch Hellriegel? How do we get close to our open run pace after we jump off a killer bike? You presented a pretty good template for yourself in your question! For sure brick training will help. Strength training is essential. Over-distance especially on the bike will enable you to come off the bike fresher, which then leads to a better run. Missing is attention to calorie intake. You MUST have gas in the tank to run fast in the second half of a 70.3 run. Then also key is going to be drawing back just slightly from “killer” on the bike to having it be extremely solid but also saving some of the effort compared to your bike fitness so that you do have enough left for a great run. The bike in a 70.3 should feel just slightly less intense than what you would bike for an Olympic distance race. That means stay on the output and cadence, but have just the slightest holding back on the pressure on the pedals so that it’s not an all out effort. Then you will have a much faster run. Question: EFTI has quite a bit to offer. I sometimes wonder if I am choosing the right items to use/view/learn from. How do you choose the right item? i.e: Total Immersion method vs a coach's view. One coach video vs another’s. Well, the beauty of EFTI is that they do have a lot to choose from, which will afford you the opportunity to look at varying views on the same topic. It will just be a matter of watching some different content on the same topic and then trying the pieces that make most sense to you and see if they actually give you improvement. Take swimming for example. One person might emphasize generating power from the hip rotation. Another might say to raise your cadence rate in the arm turnover. Try one, then try the other. Then meld the two together and see what works best. Also as you watch the videos try to see if what the person is talking about or showing is really addressing what you need help with. You might find that a lot of different views are actually saying very similar things but in different wording, and one might click what with you and you understand it better and can apply it better. Explore is my advice! Question: What suggestion to help prevent leg cramps on the run? It depends on where the cramps are happening. Quad cramps can be related to a high constant load that a race situation applies that is just not met in training very often. That requires more strength work and some hill work running to really strengthen the quads and make the cells themselves actually more impervious to pounding and load. Hamstring cramping can be associated with long-term low levels of dehydration. If you live in a dry climate or heat, it can show up if you do not drink enough fluids on a regular basis. Calf cramping can be associated with long-term stress and can show up when you add in running speedwork (another stress) or even sometimes in just a random run when you are over the limit of what your body can take. Prevention is an ongoing thing for this. Keep stress levels in check and most importantly keep your response to stressful situations calm when possible. Then if cramping is an ongoing issue it could definitely be wise to get the help of a trained health professional who can test you to make sure your electrolyte levels are up to snuff. Question: As an age group triathlete (55), do I need more rest and recovery than say a 35 year old. I am in a Tri-Club and working out with younger athletes and they are recovering faster than I am. Can I get better and faster with more recovery time? As you age you can gain more of your overall fitness from aerobic work and less speedwork than a younger athlete. Younger folks do recover faster, but they don’t get the same gains out of aerobic work as older athletes do so they have to do more fast training to get the same results. So try to balance your aerobic and anaerobic sessions to match what your body seems to be able to absorb rather than what the folks half your age might be doing. And then finally do your strength sessions religiously. Without those at 55 you will be shortchanging your potential! Question: Is the "quiet mind" in a race similar to highway hypnosis? It’s definitely not like highway hypnosis! It is more training yourself to be quiet and tuned into the rhythm of movement rather than feeling like you are being drugged and can barely stay awake. Having a quiet mind is shifting your focus away from awareness about every little sensation going on in your body and the thoughts that come with that to focusing on having an awareness that is not affected by all those sensations and what they could mean. It’s having a focus that is like seeing 360 degrees without having to look around to see everything. It’s a sense like you are in the center of life itself rather than in a race that in the moment may be going nothing like you had hoped. A quiet mind is staying fully engaged in giving everything you have in this moment, and the next and then the one after that without the worry of how it will turn out. It’s responding to the situation rather than trying to control it. It’s expansive rather than contractive. I know those are all words, but try picking one of those sentences and seeing if you can experience it in your next training session. Then pick the next sentence in the following session to see if you can experience that one, and so on until you have gone through each of them. Then you will likely have a sense of what having a quiet mind in the middle of movement, of effort, even in the middle of a painful speed session can be!